Brilliant and beautiful, Holbein Artists' Watercolor Half Pans have been created for artists who enjoy painting anywhere and everywhere. Made with traditional and modern pigments, these watercolors offer exceptional brilliance, excellent lightfastness, and crisp, clean results without muddiness. 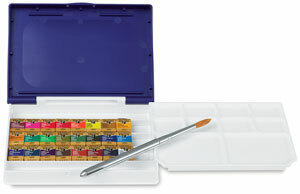 This set contains 24 half pan colors including Brilliant Orange, Burnt Sienna, Burnt Umber, Chinese White, Lemon Yellow, Olive Green, Payne's Grey, Prussian Blue, Sap Green, Ultramarine Deep, Vermilion Hue, Viridian Hue, Yellow Ochre, Dioxazine Violet, Imidazolone Brown, Indian Yellow, Opera, Pyrrol Red, Cadmium Green Pale, Cadmium Yellow Deep, Permanent Alizarin Crimson, Shadow Green, Cerulean Blue, and Cobalt Blue Pale. They come with a travel brush in a durable plastic case that includes a 10 slot mixing tray.